I come back to the shark I crocheted for my nephew as a Christmas gift. Finally, after many hours sitting in front of a computer screen, I wrote the pattern for baby shark. If you like to crochet it, below you find the pattern in USA terminology. But first I remind you the short presentation of shark on my youtube channel :-) Enjoy watching! Pattern for yellow Baby Shark is HERE. YarnArt Jeans – white (for eyeballs, teeth and bottle's teat), blue (iris) and black (pupils). 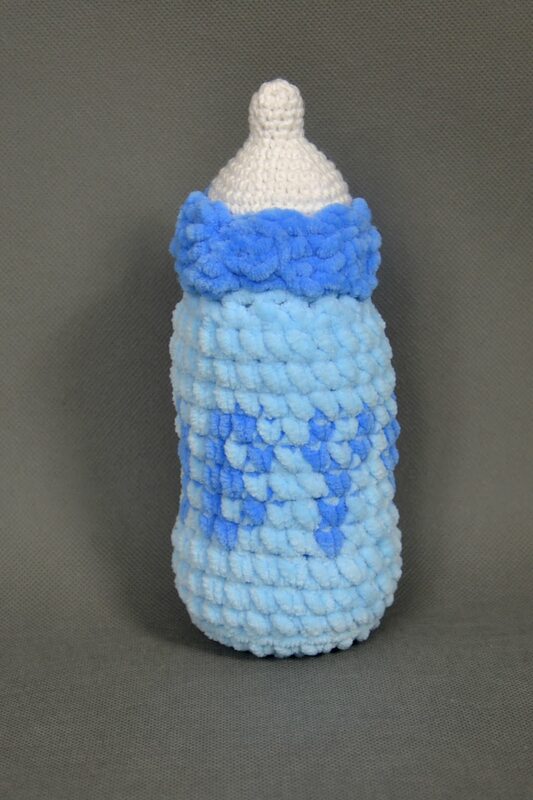 If there is written light blue in the pattern it means you should change color into light blue and crochet in this color until other color is indicated. If it is written blue it means you should change into blue and crochet next stitches in this color. I advise you to cut the previous yarn while changing colors and join the ends of yarn inside in order to secure the work. I used crochet hook 4.5 mm for Himalaya Dolphin Baby and 2.5 mm for YarnArt Jeans. I attach the photos in the pattern. Baby Shark crocheted with above yarns measures about 44 cm. Are you ready? It's time to start crocheting FUN! Start with blue yarn. From rnd 5 I will change colors during every round: start with blue, then change to light blue and then blue again. (Below the parts of rounds crocheted with light blue yarn are written in a bold print). In rnd 15 we crochet sc in BLO in 22 chains of previous round. In FLO there will be sc belonging to the mouth crocheted with pink yarn (you will see that the FLO will be then read as BLO when crocheting mouth from other side of the work). Now take a break from crocheting the body and switch to crocheting inside part of the mouth (pink yarn). Crochet in continuous rounds - from outside to inside, decreasing each round (see the photo). Rnd 1: Start from the place I finished crocheting 16th sc in 14th rnd before I changed to light blue yarn. Crochet 48 sc around (sc in next 24 st along the top jaw and sc in next 24 st along the bottom jaw). 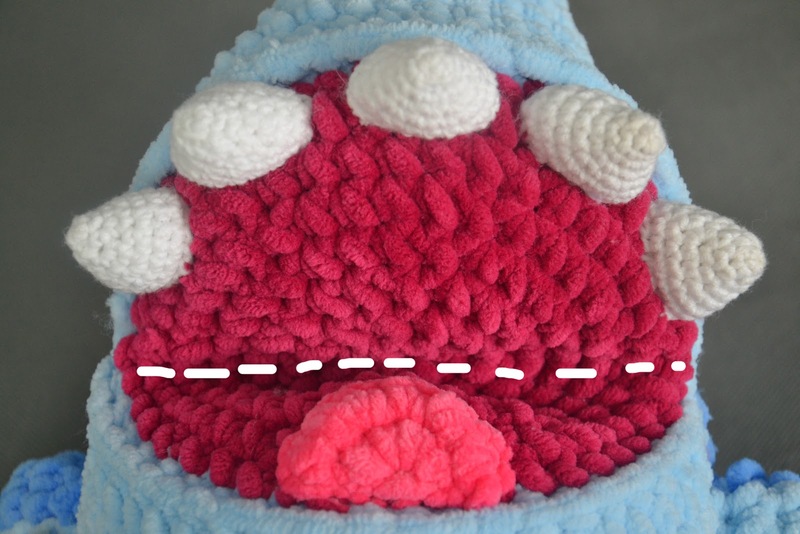 The photo below presents the crocheting direction (red dashed line) - start from red dot in the right corner and move on the left as the arrow indicates (the head is turned upside down). First round is crocheted in BLO. Fold the pink circle in half (along the line dividing the circle into semi-circular top and bottom jaw -- see the white dashed line on the photo). This line should be harden by crocheting sl st along the line inside the shark's head (on the wrong side of work). 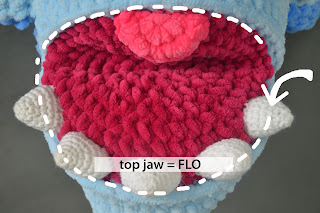 Finally I crochet sc around the mouth: insert the hook (in the place I started crocheting the mouth) and crochet 24 sc along the top jaw in FLO (these are the loops in top jaw which was unworked while I crocheted the first round of mouth in BLO). All the loops of bottom jaw are occupied, so I have to crochet FPSC along the bottom jaw. From rnd 35 crochet with blue yarn utill you reach the end. Cut the yarn, fasten off and leave a tail. Sew dorsal fin between rnd 14-15 and 22-23 of body (two points in which you stick the fin to the body along the spine). Crochet second fin the same way. Sew pectoral fin between rnd 16-17 (1st point) and 22-23 (2nd point) of body (two points in which you stick the fin to the body on the both sides). Cut the yarn, leave a tail for sewing. Stuff before you fasten off, leave a tail for sewing. Crochet the second eye the same way. Crochet the second iris the same way. Crochet the second pupil the same way. Sew all parts together – first blue iris to the eye and then black pupil to the iris. Before sewing the eyes to the head, shape the socket for the eyes in the shark’s head using blue Himalaya Dolphin Baby. Row 1: FPSC around the eye in the half upper part (crochet in semi-circular line), 1 ch, TURN. Row 2-6; sc in next 10 st, 1 ch, TURN. We have rectangular. Now, in order to form the eyelid, sew the outside points to the head Eyelid should be frame for the eye and cover it in half (as shown on the photo). Thanks to sewing the eyelid as explained above we can uplift the eyelid or cover the eye to make two ways of shark's facial expressions (It is shown in my video presentation). Crochet 5 teeth and sew them to the top jaw. 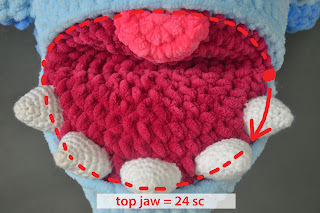 Before you start sewing teeth, I advice you to order them equally on the top jaw, attach with a pins and then sew. Remember to add stuffing to every tooth. Start with base of the BOTTLE. Himalaya Dolphin Baby light blue (main color) and then will change between two colors (light blue and blue to make lettering BABY and heart). E.g. L4, D1, L19 means, you crochet sc in next 4 st with light blue, then change to dark blue in 1 st, and then change to light blue and crochet sc in next 19 st. The brackets means you should repeat the pattern, e.g. (L1, D1) x 5 means you should repeat five times the scheme L1, D1. Crochet in continuous rounds using the marker. YarnArt Jeans white. Crochet hook 2.5 mm. Combine the teat with the bottle using sl st (we have 14 sc in the bottle and 40 sc in the teat, so it means approx. 3 st of teat are equal to 1 st of bottle (3 x 14 = 42). Insert the hook and crochet 3 sl st in one st of bottle in order to join teat with bottle (in 2 st of bottle crochet 2 sl st, because we have to subtract that two surplus stitches). Add stuffing at the end, before you close the hole. Row 1-15: BLO, 3 sc, 1 ch, TURN. Join two ends with sl st to form a ring. Sew the ring to the bottle (the seam of sl st should be hidden on the wrong side). I knitted the nappy using stocking stitch (row counts 15 stitches) and then crocheted around that rectangular, made the crochet clasp and sew the button. The nappy is wrapped around back part of shark's body. 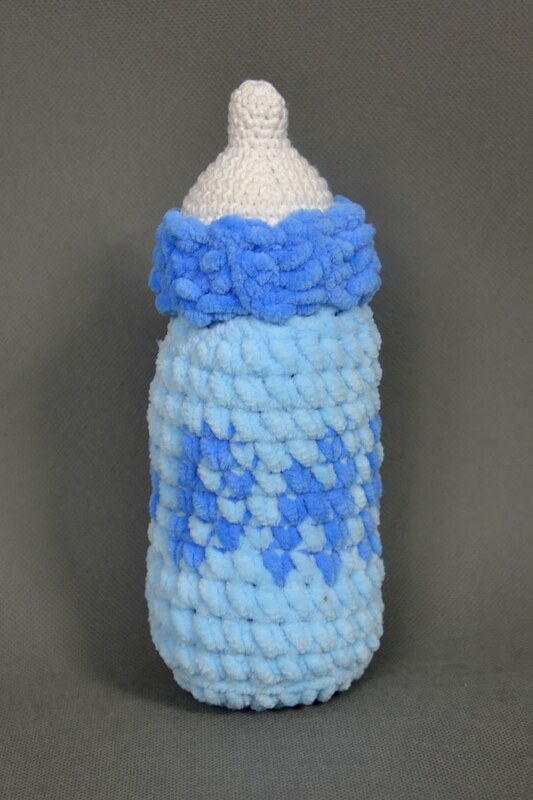 I regret I did not crochet second button, because when my nephew had fun with the shark, the nappy was unsteady, so I advice you to sew the second button on the other side. Finally I embroider gills and nostrils with dark blue thread. We are coming to an end. The photos of my shark are in the Gallery. I was doing my best to write the pattern, trying to explain you it the best I can. Moreover, if you have your own solutions or you think it would be better to change something in the pattern, please write. It would be great to see your projects based on my patterns.